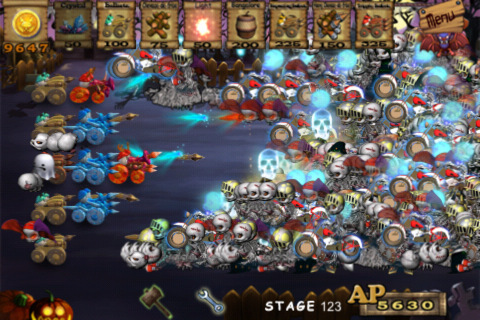 ACE Tankers is a 5-row Tower Defense game with the same game mechanics as Plants vs Zombies but with tanks and a legion of skeletons. Brought to us by OMG&atu, ACE Tankers is available on the iPhone, iPod touch, and iPad for $1.99 or a Lite version. This review is done on an iPhone 3GS. Tanks vs Skeletons–er ACE Tankers is going to naturally be compared with the monstrously popular PopCap game. So, what should we expect from ACE Tankers? I’ll try not to judge it under the shadow of Plants vs Zombies, so let’s look at ACE Tankers’ most notable qualities. First off, the art is pretty good. Tanks have slight variations that help distinguish them; the enemies all have the same skull heads but different bodies. The pseudo 3D effect reminds me of Mario RPG or som games on the Nintendo DS. The user interface has some nice designs and is relatively easy to read… which brings me to something I wish was fixed. The text in ACE Tankers needs heavy work. Descriptions of each tank and monster in the Almanac are sometimes incredibly vague flavor text filled with grammatical errors, strange formatting, and most of them are not positioned on the paper properly. I understand that some developers do not understand English or they do not have easy access to someone who understands it, but could the descriptions at least accurately describe what each unit does and then give them flavor text? PvZ did that perfectly where you knew exactly what a unit does from a few lines of text. ACE Tankers’ gameplay is almost exactly the same as said overcasting shadow. You have shooters, walls, resource amplifiers, and one-time-use bomb available, but that’s pretty much it. There are only 8 units in the game. Granted, they all perform vastly different tasks but this is a pretty limited resource pool to use. 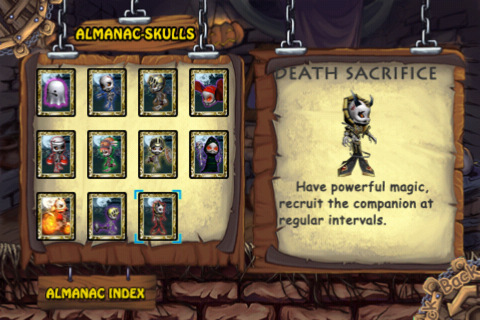 One of the best parts of Plants vs Zombies is the unlockable and customizable unit selection. You want more turret choices and less walls? Fine. Swap around a few units and you are good to go. In ACE Tankers however, your pretty much left with the same strategies, the same loadout, and the same attacking tanks. It actually makes me wish for more. Enemies are pretty resilient and some are ridiculously powerful compared to your slow, weak turrets. I found the invisible bat to be the strongest, most annoying enemy in the game. In the later rush of enemies, these bats are virtually undetectable. They require a flare to be casted but most of the time, I don’t play with the sound on, so there is no warning when my tanks slowly die off in a row, leaving one lane completely undefended. If even one enemy unit reaches the other side of the screen, it’s game over for you. In the end, this was a brave attempt at using the PvZ gameplay. I really wish for more games like this since this is my favorite style of tower defense game. With polish and work, ACE Tankers could become just as good as Plants vs Zombies. It’s gameplay speed needs to be pushed up faster, it’s unit description’s need to be more clear and honestly, that invisible bat enemy needs to die. Painfully. AppSafari review of ACE Tankers was written by Joseph Ho on June 20th, 2011 and categorized under Action, App Store, Games, Resource Management, Strategy, Tower Defense. Page viewed 4308 times, 3 so far today. Need help on using these apps? Please read the Help Page.